Headquartered in Atlanta, NCR is one of the largest, most successful financial technology firms in the world, and it is focused on helping women balance business and life in the global economy. WIN (Women in NCR) is a network of thought leaders and advocates providing women with opportunities to connect, interact and make every day easier; at home, at work and in the community. With chapters in Atlanta, Cebu, Dundee and India, it educates its members about physical and financial wellness. 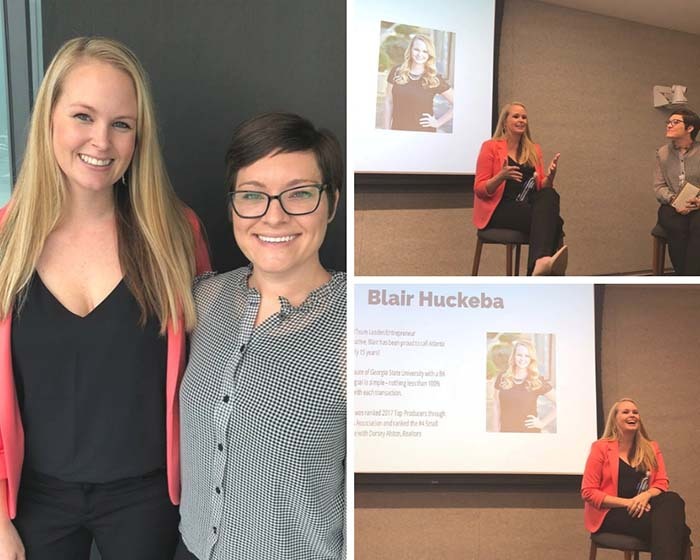 Last month, WIN invited Dorsey Alston REALTOR Blair Huckeba to talk about her career, balancing her successful real estate practice and a burgeoning restaurant business with her role as a mother of three young children and a wife. Blair has been recognized by the Atlanta REALTORS Association as a top producer, owns three restaurants and is raising three children under the age of four. She and her partners own Pour. Kitchen + Bar in Brookhaven, which is a neighborhood wine bar and eatery. They are in the process of opening two locations of New Jersey-based Playa Bowls, one on the Beltline, and one in Chamblee. She hopes to open more Georgia locations in the coming years. NCR enables more than 700 million daily transactions across retail, finance, travel, hospitality, telecom and technology and is the No. 1 Point of Sale Software for retail and hospitality. Through WIN, it seeks to become a positive change agent and an innovative and diverse place for women to work through professional, personal and community engagement programs.